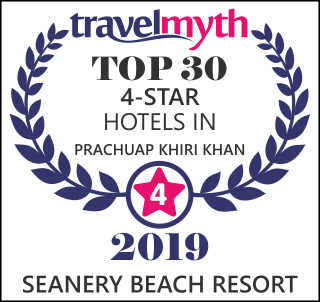 If you need a break from the hustle and bustle of the city or routine life and are looking for a conveniently located accommodation in Prachuap Khiri Khan, look no further than “ SEANERY Beach Resort ”, a must-visit resort you can earn more impressive memories and recharge energy to refresh your living among sea breeze and greenery of nature. 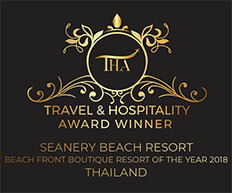 SEANERY Beach Resort is set on the shore of the Gulf of Thailand and is located in the most exclusive beach in Bang Saphan District, a rich getaway in the province of Prachuap Khiri Khan. SEANERY is private, peaceful, and far from the disturbances of urban society while still being only at arm’s length from natures, cultures, all the amenities of the city in 4 km., and an array of beautiful attractions. The mostly tranquil beach town has some surprises in store yet. 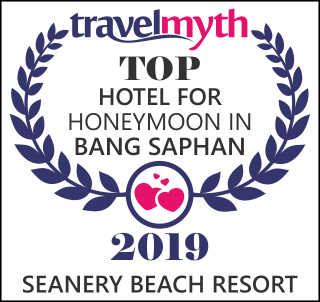 With an outstanding landscape of 50-meter peaceful beachfront and an exciting 20-meter high slope, SEANERY offers 5 luxury Beachfront and Beach Pool Villas, plus 14 luxury Sea View – Hill Suites. All are facing the sea and incorporated by gorgeous natural scenery into their friendly environmental design. Rejuvenate and relax amidst your own tropical paradise as well as sunbath at your private terrace, with excitement never far off. Well trained and attentive staff oversee your every need and a myriad of quality facilities enrich your living. Be warmed by the fact that all of this splendor is entirely environmentally friendly and is actually working against global warming. 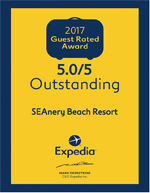 &COPY; Seanery Beach Resort. All rights reserved.